ensure that everything in your home is in excellent working condition. plans, please feel free to call or email me. I look forward to hearing from you. Drains: Clean with baking soda. Pour water down unused drains. Pipes: Inspect visible pipes for leaks. Kitchen and bathroom cabinets: Check under and around for leaks. Toilets: Check for stability and leaks. Water heater: Check area around water heater for leaks. If you have hard water, drain 1-2 gallons water. Wood cabinets and trim: Apply a wood protectant. Garage door: Lubricate hardware. Inspect mechanism for free travel. Window and door tracks: Check to see if weep holes are open. Clean out dirt and dust. Lubricate rollers and latches. Basement or crawl space: Check for cracks or any sign of dampness or leaks. Check for any evidence of termites or wood-eating insects. Ceramic tile: Check and clean grout. Heating and cooling systems: Clean and replace filters if necessary. Kitchen exhaust fan: Remove and clean the filter. Clean accumulated grease deposits from the fan housing. Refrigerator: Clean dust from top. Clean refrigerator drain pan. Clean and defrost freezer if necessary. Wiring, electrical cords, and plugs: Check for wear or damage. Replace if necessary. Smoke detector: Test for proper operation and replace batteries if necessary. GFI outlets: Test for proper operation. 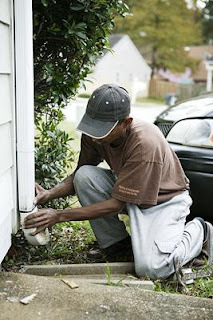 Foundation: Inspect visible areas, vents, and ducts for cracks, leaks, or blockages. Landscaping: Check for proper drainage. Concrete and asphalt: Clean oil and grease. Plumbing shut-off valves: Inspect for proper operation. Water heater: Flush out hot water to remove accumulated sediment. Faucet aerators : Check for proper flow of water. If the flow is reduced, clean the aerator screens. During the first two months, the faucet aerators could require more frequent cleaning. Attic: Examine for evidence of any leaks. Check insulation and remove or add if necessary. Check for evidence of birds, squirrels, raccoons, etc. Check for proper ventilation. Counter tops: Inspect for separations at sinks and back-splash. Re-caulk where required. Tiled areas: Inspect for loose or missing grout or caulking. Re-grout or re-caulk if necessary. Shower doors/tub enclosures: Inspect for proper fit. Adjust if necessary. Inspect caulking and re-caulk if necessary. Weather stripping: Check caulking around windows and doors. Check window and door screens. Adjust or replace if necessary. Sectional garage doors: Adjust the travel and tension. Fireplace: Inspect flues. Clean if necessary. Inspect fireplace brick and mortar for cracks or damage. Heating system: Service heating system and heat pump. Cooling system: Remove debris from around units and clean with garden hose. Remove window air conditioner or protect with weatherproof cover. Clean and replace filters if necessary. Combustible appliances: Inspect and service if necessary. Roof: Check for leaks. Check for damaged, loose, or missing shingles. Check vents and louvers for birds, nests, squirrels, and insects. Check flashing around roof stacks, vents, and skylights for leaks. Chimney: Clean and check for deteriorating bricks and mortar. Check for leaks. Check for birds, nests, squirrels, and insects. Gutters and downspouts: Clean and check for leaks, misalignment, or damage. Exterior walls: Check for deteriorating bricks and mortar. Check siding for damage or rot. Check painted surfaces for flaking. Landscaping: Trim shrubbery around walls. Remove tree limbs, branches, or debris that can attract insects (no wood or shrubbery should be closer than 3 inches to your house). Maintain grading. Concrete and asphalt: Check for cracks or deterioration. Reseal or repair if necessary. Septic system: Examine septic system drain field for flooding and odour. Have tank pumped yearly. Lawn and patio furniture: Clean and store or cover with weatherproof material. Heating and cooling system: General furnace inspection: Look for rust, scaling on heat exchanger, and proper flame color; note odd sounds or smells; and check condition of venting. Remove debris around units. Decks: Scrub mildewed areas and treat for water stains, mildew, and fungus. Roof: Clean. Check for leaks. Check for damaged, loose or missing shingles. Check vents and louvers for birds, nests, squirrels, and insects. Check flashing around roof stacks, vents, and skylights for leaks.